I love cherries.Nope,not the fresh cherries,or cherries in syrup on cherries in a can,but the cherries in Sugar syrup or more commonly known as Glace cherries.I can munch on them any time of the day.Back home,we used to get these in small quantities from the Bakery opposite our house where they sat prettily in huge glass jars every now and then.Whenever Custard was made,we got cherries.Whenever we bought Ice-cream,we got some cherries.In fact,we used to have these cherries on their own sometimes after meals and call them our dessert of the day! No wonder then I used to like cherries in my cakes too.I like the glace-cherry filled Blackforest cake any day over the ones with Maraschino cherries.A friend once called me old-fashioned when I mentioned I make my Blackforest Cake using glace cherries.I have tried a similar cake before which called for glace cherries and loved it.I was actually looking for some colored cherries since it is this time of the season.Imagine the color burst if this cake had green and yellow cherries too along with red ones!! 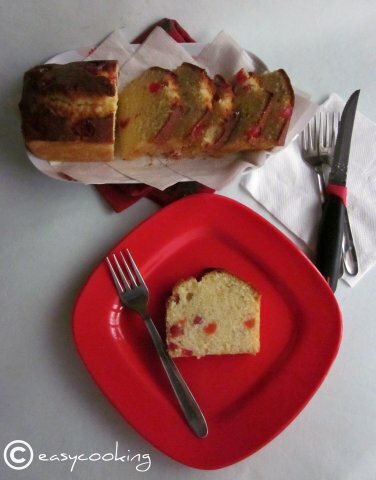 I would call this a bakery style cake.It is more like a tea-cake than a sweet treat.Buttery and melt in the mouth,almost like a pound cake,with cherries in every bite,I can see myself baking this again and again. Grease and line a loaf tin or a small cake tin[6' or 7' round/square]. Sift together flour,baking powder and salt. Prepare the cherries-wash them well and pat them dry using a kitchen towel. Cream together butter and sugar till light and fluffy-about 5 minutes on an electric beater. Mix in the beaten eggs little at a time with Vanilla essence and beat for another 5 minutes till the mix becomes creamy. Mix in the flour mix [keep 1 tbsp aside for the cherries] and beat on low speed,alternating with the milk till you get a smooth batter,the batter is fairly thick and not of pourable consistency,it is rather of a dropping consistency. Add the 1 tbsp flour to the cherries and give a good shake-fold it into the batter. Pour the batter into the prepared loaf tin and bake for 35-40 minutes or till the cake is golden brown and firm and a toothpick inserted comes out clean. Cool and cut into thick slices. On a different note-I keep getting mails from readers asking what kind of measuring tool[s] I use for baking.I started with an old coffee mug for measuring dry ingredients and a liquid measuring cup I got as a freebie with something for liquids.I got good results but I should say my baking has definitely improved after I got a measuring cups and spoons set.For conversions,I used this website,which I found very useful.I now have a digital weighing scale which makes baking more easier. What measuring tools do you use? 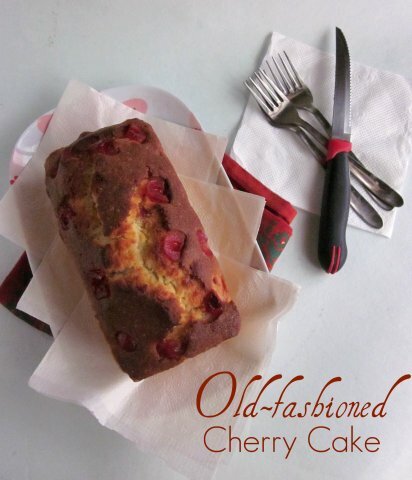 Old-Fashioned Cherry Loaf cake is off to Suma's Blog Anniversary event!! Divu..its in Xmas spirit, already feels like digging into the screen! Those slices look super-di-duper yum! Divya divya now i want the cake.... its so tempting!!! Irresistible loaf cake, very tempting. Cherry cake looks awesome Divya! The cake looks perfect for the festive season. I use the measuring cups and a handy weighting scale. See you soon, got a mail from Valli. take care. True.. there is something about these delicious vanilla tea cakes which makes u try out so many versions and love all of them! Looks very inviting with those cherries peeking out her and there..
WOW, AWESOME. Love the cake and will try this soon. EXCELLENT Divya. Joy of baking also has a good conversion lists. I have an eight tool baking set-from 1/4 tsp to 1 cup. I prefer measurements in cups rather than gms. 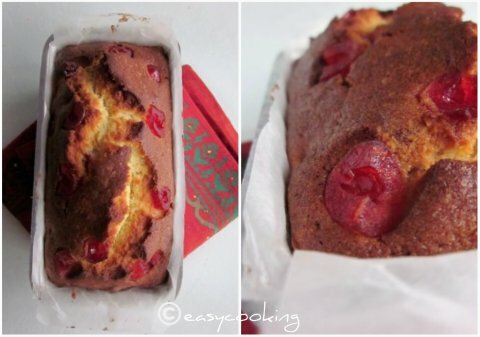 Cherry cake looks so tempting..
really good one ! fab clicks and lovely presentation ! Oh wow!! That looks super!! That is just a pretty pretty sight. Just a bite of this and a sip of coffee ...few of my favorite things! Simply superb .. I am just jumping from one blog to the other.. and Let me tell you m just becoming a follower now.. 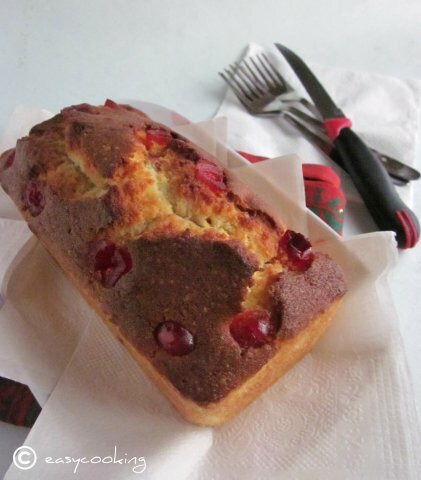 I'm a big fan of cherries and I'm sure i would love this loaf!